Glenafton legend Danny McCulloch (he also had a short spell at the Buffs) scored the Glens opener in the 3-2 Scottish Junior Cup 2nd round win over the Buffs in season 1960/61 at Kilwinning. With both sides chasing promotion from their respective league, Kilwinning handily positioned third-top of the Ayrshire District League and Glenafton sitting top of the Super League 1st Division, the scene was set for an intriguing all Ayrshire Emirates Scottish Junior Cup 4th round tie at Abbey Park. 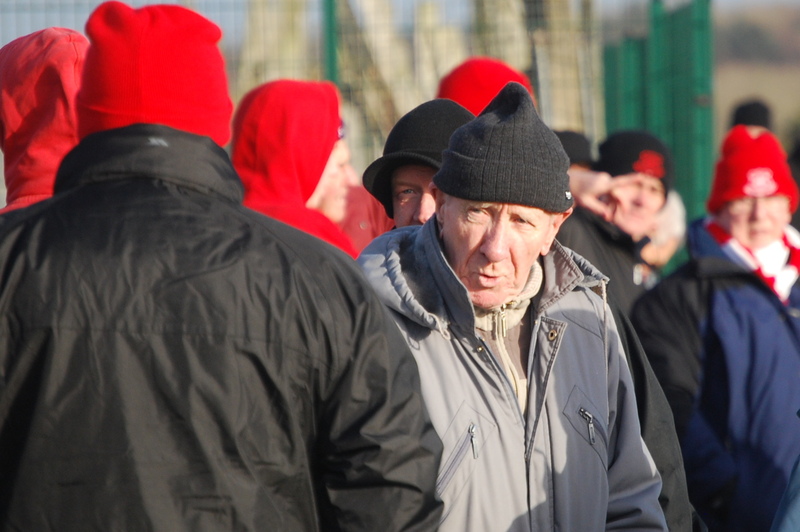 Glenafton kicked off in the bright sunshine against a cold cutting wind that blasted from the shed end goal-mouth to the one guarding the Garnock Water gushing its way to the Irvine Bay well fed by the heavy rain that fell overnight. Neither team could master elements in the opening encounters. The Buffs won two corners in five minutes but both times the ball was more likely to end up in the Garnock rather than in Glenafton’s net. Meanwhile the visitors had little time to dwell on the ball having to rush their clearances from defence and their progress upfield was very much three steps forward and two back at times. A couple of free kicks from 20 yards out came and went without keeper Fraser Stewart being tested. 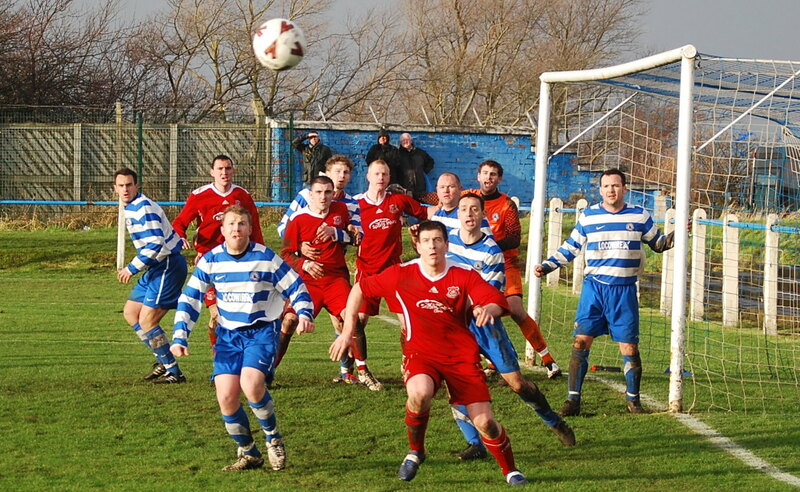 In stark contrast Kilwinning’s attacks were often at break-neck speed with the pace of Ben Lewis, doubly dangerous when wind assisted, down the right flank keeping the Glenafton rear guard on their toes. On 15 minutes he combined well with the equally impressive David Smith but the attacking wing back’s shot from an acute angle was blocked by Robbie Henderson at the expense of another corner kick. Now having the measure of the wind the kick found the head of former Glenafton striker Michael Hart but the close attention of Richie McKillen forced his header well wide of target. Three minutes later Andy Bell’s perseverance down the left earned the Glens their first corner kick but it too suffered from their previous set piece malaise and lacked threat. Midway through the half the Buffs made good effect of the left wing with a run by Barry Fleeting ending in a shot that was deflected narrowly wide of Semple’s far post with the keeper stranded. The resultant corner caused panic with Neil Shearer’s header falling for Lewis but his attempt to fire home was blocked by John Dempster and then Barry Russell blasted the loose ball wide. The sunshine gave way to thick heavy cloud and the heavens opened for seven minutes filling the shed with supporters of both sides in jig time while no doubt at the other end the Garnock swelled further. Not for the feint hearted .This proved to be the visitors’ best spell in terms of possession at least and the Buffs box was the busier of the two. With 33 minutes gone the Glens seriously tested Stewart for the first time and the keeper was up to challenge coming off his line to dive at the feet of Dempster after the big striker had bustled past Shearer and Lee Grant to break into the box. The Buffs almost doubled their lead from a Bruce McMaster free kick ten minutes into the new half. Semple at full stretch punched the ball from under the bar as Fabiani looked certain to head home and then Dempster blocked Lewis’ attempt to slot home from close range allowing Semple gather. Three minutes later Henderson headed a McKenzie corner wide of targets as the game entered a period of chances being swapped at either end. Indeed three minutes after that Henderson, in his more natural defensive role slid into prevent Hart and Lewis connecting with another killer cross from McMaster on the left. The Glens countered with a couple of corners but again the Buffs defence was not to be breached. On 69 minutes keeper Stewart looked flustered for the first time as McKenzie wriggled his way through a packed box before Bell picked up the cudgel but his attempt to scissors kick the ball home went wide. This entry was posted in GAFC Match Report and tagged Emirates Scottish Junior Cup, Glenafton Athletic, Kilwinning Rangers, New Cumnock, Scottish Junior Football. Bookmark the permalink.